A four-wheeled personal transportation device made of lightweight aluminum (4.4 to 6.6 pounds) that you can carry in your bag and operate like a Segway by simply shifting your weight in the direction you want to go. The laptop-size board can take loads up to 265 pounds and is powered by a lithium battery that can reach speeds up to 6.2 miles per hour. Three hours of charging provides enough power for travelling distances of up to 7.4 miles. 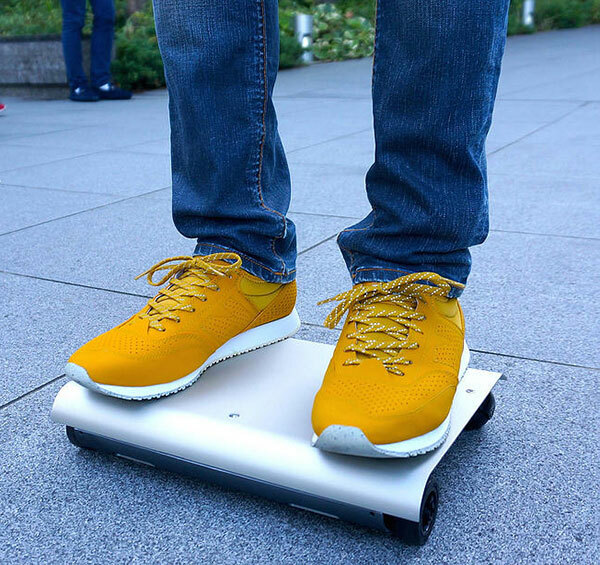 The WalkCar starts automatically once the rider stands on it while stepping off stops the vehicle. The WalkCar was developed by Kuniako Saito and his team at Cocoa Motors. He tells Reuters: "What if we could just carry our transportation in our bags, wouldn't that mean we'd always have our transportation with us to ride on?' And my friend asked me to make one, since I was doing my masters in engineering specifically on electric car motor control systems."